The Town of Braselton, Georgia has a rich heritage and the unique characteristic of being located not only in one county, but spanning into four: Jackson, Hall, Gwinnett, and Barrow. 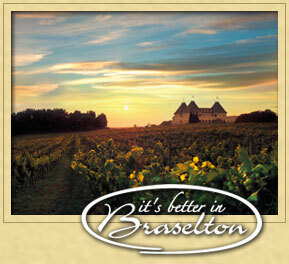 Our dynamic community is the home to the world class amenity, Chateau Elan Winery and Resort. The resort attracts more than a half a million visitors a year and the adjoining Chateau Elan Golf and Residential community has thrived as part of Braselton. Add to this the excellent business location on the I-85 business corridor and you have a premier live, work, and play community that boasts an excellent quality of life. Braselton’s history is important. The Braselton Town Hall, a former stately home of one of the Braselton Brothers, is the seat of government. After an award-winning historic preservation effort, it stands as a reminder of the era in which the town was founded and built. A visit to our downtown, listed on the National Register of Historic Places, will give you a glimpse into the past as you shop our various antique, art and specialty retail facilities located in historic structures throughout the district.